These South African birds are named for their almost all black coloring and, of course, their extremely long tail. The tail of the males can be over 16 inches long, which is more than twice their body length. 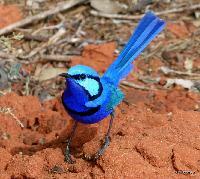 The males are fully blue when breeding, but otherwise look more similar to the females. They turn pale brown on top and white underneath, although retain the blue on wings and tail. 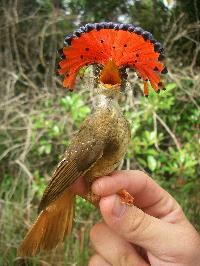 There are 4 species of royal flycatchers all with the royal crown which is generally only on display during courtship rituals and competitions with other males. Usually the crest is lying flat but opens up like a fan. The ornamental head plumes on the males are so bizarre that when the first specimen was brought to Europe, people thought it was fake. Many people believe these are the most beautiful birds in the world. 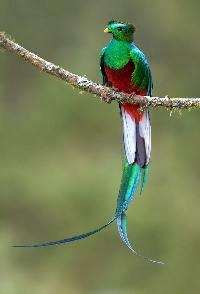 They are the national bird of Guatemala, and name to the Guatemalan currency. This bird (and the other species of rollers) get their name from their impressive courtship flight, a fast, shallow dive from considerable elevation with a rolling or fast rocking motion, accompanied by loud raucous calls. These awesome seabirds with mustaches nest in rocky hollows or burrows along the coasts of Peru and Chile. 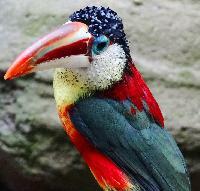 This bird is a member of the toucan family and gets it s name from the feathers on it s head that are curled up like ribbons on a gift. This is one of 42 barbet species all of which are found in sub Saharan Africa. There are 3 sub species of this bird which differ primarily in the extent of the throat patch and in the coloration of the head. They are residents of the lowland tropical forests of eastern South America.